To the office I have been wearing these pants from H&M a lot. I have been able to wear them in a lot of different ways, and they are so much more comfortable than most of my dress pants. Plaid is definitely having a moment this season beyond the typical fall flannels. I am sure everyone has seen in stores selling outfits that are reminiscent of Cher from Clueless with matching sets of plaid skirts and jackets. I love having my closet filled with different patterns and bright colors, so when I saw these pants walking home from work one day, I grabbed them. 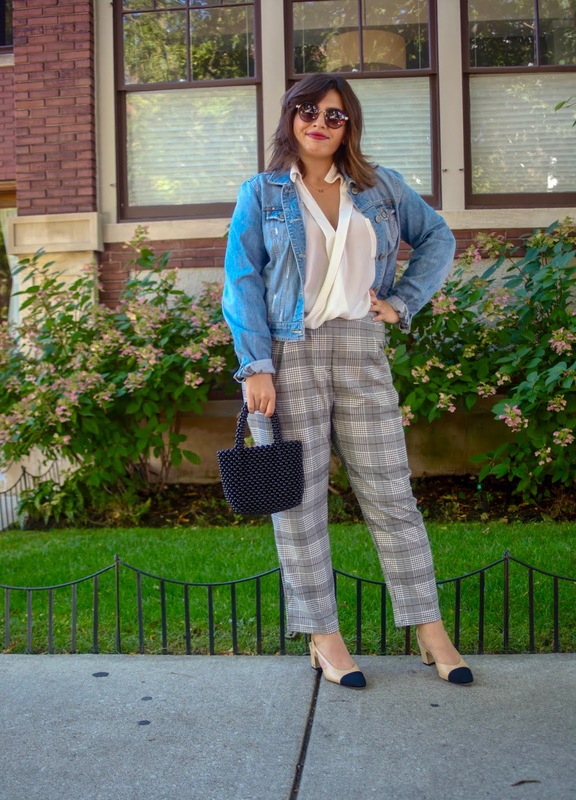 I paired the pants with a white blouse from Forever21 and a blazer from H&M that I got from high school. Although these stores typically sell items that designed to only last one or two years, I spend a lot of time in those stores finding pieces that will not only be in style for a long time, but will physically last me a long time as well. I want to be the one deciding whether I will part with an article of clothing, not a bad seam or fabric. With this outfit, I am wearing my Chanel sling-backs. I gifted them to myself when starting my new job. When purchasing these shoes, I knew that I would have them forever since they are a timeless design. In addition to that, they are extremely comfortable due to the block heel. I did not want to spend a large amount of money on shoes that would just sit in my closet. In addition to buying pieces that last a long time, I think it is important to purchase items that can be worn in multiple ways so they are not just hanging in your closet. By removing the blazer, I have an outfit perfect for walking around during a warmer fall day. I also can wear these pieces with a jean jacket (another piece I have had for years) to dress down the look, perfect for an outdoor lunch with a friend. What are some pieces in your wardrobe you have had forever? Let me know in the comments down below!